Win Lotto Systems is a software and ebook package designed to help lottery players win smaller prizes more often. The idea is that you should win a regular stream of smaller prizes, whilst waiting for that big jackpot win to come along. The ebook is 50 pages long, but is all useful content and not waffle. It was originally designed by Mark Collard, and is now published by Professor William Foster (and yes, this one is actually a real professor). Some of the ideas originate from James Gray-Brown who wrote the short book “Who Wants To Be A Lottery Millionaire” – out of print for many years now. It comes in 4 parts and overall is pretty easy to follow and understand. Part 1 is mainly introductory explanation, which is necessary to justify the approach the author ultimately takes. Some might get a bit lost with a couple of pages of the maths mentioned here – but it’s not necessary to understand those bits, so you can just skim over. Then Part 2 moves on to explain ‘Win Lotto Systems’ itself. Firstly introducing the 3 different systems for different playing budgets – Thrift, Econo and Power. Then explaining how to apply it based on your chosen playing budget and game. It’s designed for 5, 6, and 7 number lottery draws – so pretty much all games in every country. You can play with as little as 7 tickets, or up to hundreds which is useful for syndicate play. Note: It does not cover Pick 3 or Pick 4 types games. I don’t recommend playing these games anyway as the big prizes are just too small. Part 3 details all the systems available to you, and takes you through some specific examples of how you can combine them to cover more numbers at less cost. Part 4 is then just a brief summary. The software is pretty basic looking and runs under Windows only (there may be a Mac or Linux version one day, but for now definitely Windows only). It’s been designed only to apply the specific systems discussed in the Win Lotto Systems ebook. Which means it’s easy to use and free of any unecessary clutter. A results checker is included to save you having to analyse each ticket. This is one of the rare lottery books that actually gets the basics correct. There is no mumbo jumbo or silly science here – the author knows and understands why analysing historical results cannot help you. Instead he simply focuses on sensible playing strategies. Can you get better lottery software? Without a doubt you can get far more advanced software. The problem is it will include lots of useless features that analyse numbers and attempt to predict results. The Win Lotto Systems software is designed to be simple. It does only what it needs to, and as a result is very easy to use. Trust me, I’ve seen and tried to use some horribly designed lottery software! So, if you want good common sense advice and a solid playing strategy that is easy to use, then Win Lotto Systems is recommended. If however you want something that can predict results, or provide similar miracles then this is not for you. Of the 4 systems that I have invested my hard earned money in, it is the only system that has returned money on a consistent basis. My budget is $30.00AU per week and on average over the last 12 weeks I have won $26.50 per week. Keeps me playing regularly for minimal cost. The claiment shoots himself in the foot by claiming he only recouped 92% of his outlay that means the system lost 8%! If the system works, all it seems to do is cut your losses to a minimum, making it cheap to play. LG: But cheap to play is a good thing. It’s the best you can possibly get until hitting the jackpot! Bought the tickets as suggested, won 1 time. That’s it. Got 10 Euro’s back from the 40 I spend playing. It’s a lost. LG: You’re missing the point – winning small prizes while waiting for a big one. Read the book again. Had Win Lotto Systems 6 months now, hit 4 ball win 4 times already, and lots of 3 ball wins. The software works, no doubt about it. But the million dollar question is: How to select the most likely possible numbers to be drawn for the next draw? Is there any software that can help to narrow down the range to 15 possible numbers or less than that? LG: Sorry, no there isn’t. I can point you to lots of software that claims to predict results, but none of it works. I have owned WinLottoSystems for about 2 years. Good concept but too expensive for my South Carolina Cash 5 game which plays 7 days per week. This system offers limited coverage of numbers unless I play more than 8 numbers per draw. I would like to play at least 16 numbers but $16 per draw 7 draws per week is $112. LG: Play more numbers in less draws! Put your playing budget into 1 draw per week. I’ve used this system for a while now. Well over a year. But the main thing to take away from the the story here is the winning of the smaller prizes till you can hit a big one. That is the real “diamond” of this system. If you check out the odds for the lower prizes you will see. This one idea turned my lotto performance totally around. They also have some great wheeling combinations in their system. The only drawbacks to the system IMHO are: The amount of lines that must be played for the numbers chosen. No data system to track and analyze numbers for future draws. Their belief that you cannot predict future numbers to some degree. I have had great success doing that this year. It just takes a lot of work. I bought the Win Lotto Systems ebook, back in August. Since then, I have won smaller prizes 3 out of every 4 times I play. This system is the real deal. Please share you views or experiences of Win Lotto Systems by adding your comment or review below. Thanks, LG. If you refer to wheeling systems they are free on the net. So far the only thing working is to wheel all the 49 numbers in 163 combinations. This is pure math and guarantees a 3/6. The wheel is free on the net. 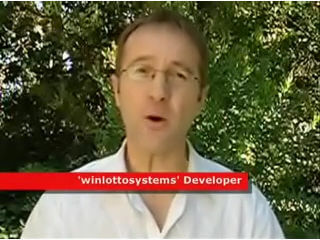 Win Lotto Systems is not just a wheeling system (did you read the review..?). But the difference between a good wheel and a bad one is vast. Yes, the internet is full of free wheeling systems and good luck to you if you choose to use them. But why shave a few dollars when every lottery ticket you buy in future depends on it..!? Makes no sense to me. If you want quality wheeling systems then get Bluskov’s book. Does the software contain wheels that have rules? I have been researching the lottery wheels and have discovered that a good wheel which you can stipulate to not include all high or all low numbers is pretty much essential. If it has this feature then I am sold! No, it doesn’t include any filtering options. But this kind of filtering is not useful anyway. If you think about it, why would certain combinations of high/low numbers be more or less likely than any other combination? They are all just balls bouncing around a plastic tub. Yes but whilst that is true, you can’t ignore the stats that prove that all high or all low numbers occur in only 5% of draws. It has to be relevant for the best chance at a jackpot. Hi, wonder if this system can also play with US MegaMillion which is 75 numbers that requires 5 + 1? Where the last digit runs from 1-15? How do you use it with 5 numbers? And how to also play the 1-15 together? Can you explain which configuration you suggest here? The software does handle games with 5 (and 6) main balls. It doesn’t do anything with supplementary balls (Powerballs/Megaballs etc). Will suggests you either choose one and play this for all combinations, or cycle throuugh all the numbers. Which you do may also be influenced by the prize structure of the game, i.e. how those balls affect the smaller prizes. I’m thinking of making the purchase, but I’m not sure of actual price. Don’t want to get surprise charges against my credit card later on. What is the actual cost of Win Lotto System in US dollars. I don’t understand the price of $250, $67, $47. Is it all three prices added together, or one or the other for pieces of the package. If you know, please explain it to me. I don’t want to issue a blank check. It’s currently just a straightforward $47 for the whole package Marcia. (I think the $250 and $67 are supposed to be crossed out). There are no extra charges or pieces of the package, it’s just one package at one price. LG, the WinLottoSystem is a wheel generator and you choose your own numbers to play. I can find books on how to wheel your combinations on the internet for free. Why pay $ 47 when I can get it for free. I do have Smart Luck WG and I got it a while back when I was still living in California. Won some nice prizes using the wheels for a Lotto Pool which I had created. The wheel generator is just half the package – the book contains more information about the approach/strategy. That said, the wheel generator you have is probably fine. For the best wheeling systems though I recommend Bluskov’s (some may be better optimised than Smart Luck). Or if you’re looking for an overall strategy this should help. Bought the system but found it not useful so I requested a refund after 5 days. A funny thing happened! Firstly, I did not find “Customer Support at Clickbank, details” on the receipt anywhere. When I did contact Clickbank Customer Support and provided my PayPal Transaction ID & the Payment ID on the receipt, they said they could not find any trace of my purchase. According to the receipt, the purchase was made through or from: “JVZoo.com”. Just dropped an email to sales@winlottofrequently.com and info@winlottofrequently.com. Awaiting response. So, buyers, please be aware of this contradicting refund instructions! Yes, I just got my refund! I would like to know if your Win System Lottery will work for the South African Lotto and Power Ball. Hi, you saying the lottery win track system really works? No, Win-Track churn out endless useless system. This review is about ‘Win Lotto Systems’.